Buying a loom? There are many considerations - what do you want to weave - fabric, rugs, tapestry; how big a piece do you intend to weave; how much space do you have; is this your first loom; what is your level of knowledge and interest; is the loom for you or someone else; price goes up with size and features - how much do you want to spend? Your first loom could be an inkle loom or a rigid heddle loom. These looms are fairly easy to master, are small (suitable for children) but offer an insight into many aspects of weaving. Regardless of the loom you choose, the width indicates how wide a fabric you will be able to weave; the length can be many yards on floor looms; it is more limited on rigid heddle or table looms. Perhaps you would like a 4-harness loom as your first loom; the more harnesses (some people call them shafts) a loom has, the more design possibilities it offers. (Some looms have as many as sixteen harnesses). 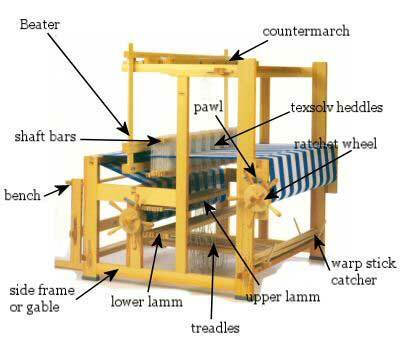 Among 4-harness looms a table loom is cheaper, can be moved easily, but is hand-operated and therefore much slower than a floor loom; because of its low weight and width, the weaving possibilities are limited. But it is good for beginners, demonstration purposes, samples and workshops. If a first loom, it can be used later for samples, research and small projects. A floor loom should be your choice if you have enough space. It is heavier and stronger, works much faster than a table loom, offers more possibilities and gives a better shed because of its greater depth. Among floor looms some are light and can be folded (Jack types), others are heavier and take more space. If you plan on weaving mostly rugs a heavy, sturdy loom such as the Glimåkra Standard, Leclerc Nilus II, or the Schacht Cranbrook should be your choice. - Jack-type looms work as well for balanced weaving as for unbalanced weaving (1 harness against 3) because each harness frame is operated independently; however the treadling is slightly noisier and harder than on counterbalance looms and, because the tension on the warp cannot be very high, non-eleastic warps (linen, nylon) are not recommended on these looms. If you plan on doing a great amount of fabric weaving, a jack loom may suit your work. - Counterbalance looms are quiet and have a faster and softer treadling than jack-type looms; they allow a high warp tension (important in rugweaving) and elastic warps (wool, cotton) as well as non-elastic warps; the shed is not perfect when weaving is unbalanced but with some looms (Leclerc) the problem is solved by adding a shed regulator. - Countermarch looms (such as Glimakra's Ideal and Standard, and the Schacht Cranbrook Loom) combine the rising/sinking action of the counterbalance loom with the ability of the jack loom to open any shed, whether balanced or unbalanced. They are quiet, sturdy and the favorite of many highly skilled weavers. The beater on a loom can either pivot from the bottom or swing from a support above the weaving. Overhead beaters are somewhat easier to work with and are less tiring. The weight of the beater is an important feature as a heavier unit will allow you to beat down more easily. Beyond the primary components of a loom there are many Weaving Accessories - Weaving Benches, Weaving Reeds, Sectional Warp Beams, Heddles, Shuttles, dobbies (see manufacturers page), bobbin winders and more. A lot to consider. If you are a beginner give us a call or e-mail us and we can consult with you or suggest good weaving books and weaving videos that will provide you with the background to make an informed choice. 3. yarn balance, magnifier, Ott light, auto reed hook or more harnesses.